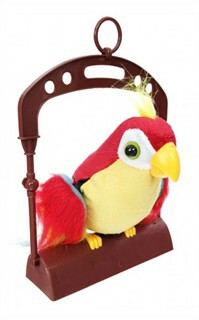 This Talking Toy Parrot is a wise cracking bird that will have you and your friends cracking up! Watch as his wings flap and beak moves as he speaks. Simply walk by Walter the Parrot and listen to funny phrases like: With a face like that, I'd rather be a parrot! 3 AA batteries required (not included). Availability: This Talking Toy Parrot usually ships in 1 business day.